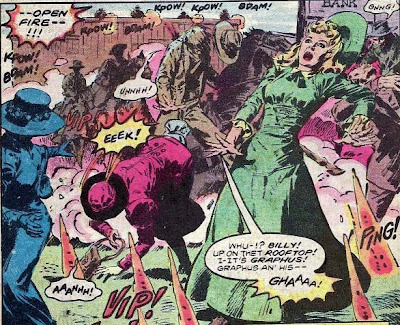 Matching Dragoons: Jonah Hex #74 "The Bloody Saga of Railroad Bill!" 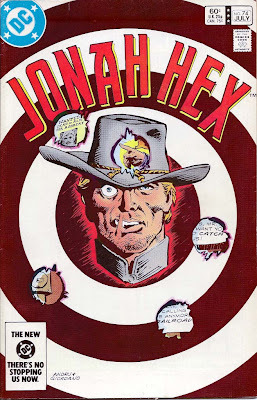 Jonah Hex #74 "The Bloody Saga of Railroad Bill!" "The Bloody Saga of Railroad Bill!" Jonah Hex stands in front of the desk of Mr. Thorgson, the owner of a railroad. Thorgson is railing (hee hee) against William Clinton, a train robber, who has been unstoppable. Clinton rode with Quantrill and has learned how to get the locals on his side, helping him cover his tracks. Hex asks why the Pinkertons haven't been involved and Thorgson says that the railroad has hired Pinkerton Archibald Graphus, but he keeps coming up empty handed. Now Thorgson is hiring Hex using his own money in order not to antagonize Graphus. A week later in the town of Franklin Forks, we find Graphus and eight of his men crouching on a rooftop on main street. They are staking out the bank on a tip that Clinton will be knocking over that bank today (Looks like Clinton robs more than just trains). Sure enough, Clinton and twelve of his men come riding into town. He leaves two men outside to hold the horses and the rest head into the bank. Once in the bank, Clinton notices an old man who is wearing Confederate medals. He asks the man if the medals are his and the old man affirms that he got them at Chickamauga and Vicksburg and says that Clinton is now taking all the money he has in the world. Clinton tells him that he has never stolen from a fellow Reb and never will. Clinton pulls out a fat wad of bills and gives them to the Rebel Vet. A few minutes later Clinton and his men are leaving the bank and Graphus is getting ready to give the signal to open fire (they waited until the bank had been robbed so that the crooks would have their hands full and be unable to fire back) when the local choir practice adjourns and a bunch of women walk out into the street. Ignoring the danger to innocent civilians, Graphus orders his men to open fire and when the dust settles eight of Clinton's men are dead along with several choir members. The bodies aren't even cooling in the street before Graphus and his men head out after Clinton & his gang. 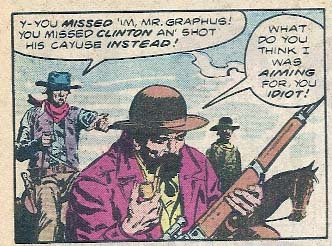 Clinton and his men split up, but Graphus is looking down from a hilltop and pulls out his Remington with the fancy new sight, takes aim and drops Bill Clinton's horse is mid stride. Clinton's men are long gone already and Graphus & his bunch soon have Clinton sitting atop a horse with a noose around his neck. 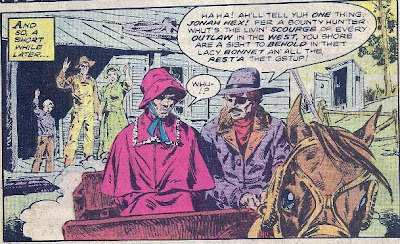 Just then, Jonah Hex rides up. Jonah starts telling Graphus that they can't hang Clinton without a trial and during the argument, Clinton manages to get to a knife in the back of his pants and cuts himself loose. He then buries the knife into the sternum of one of Graphus's men. Tossing aside the noose, Clinton spurs the horse onward and rides off. Jonah takes off after but Graphus isn't fooled, he sees that these two are working together and he shoots Hex in the back. Clinton hears the shot and turns to see Hex laying in the dirt. Bill Clinton wheels his horse around and clutching the reins in his teeth and firing his rifle like a man possessed, he charges Graphus and his men, allowing Jonah to climb on the back of the horse and they both make their escape. Shortly, Clinton & Hex arrive at a farmer's house. The farmer agrees to help Clinton and Hex because of how much he hates the railroads. Soon after, the two men are leaving in a borrowed buckboard. Clinton tells Jonah that he recognizes Hex and he is going to take Hex to Ma Clinton's place to get patched up. If they run into each other after that, Clinton will have to kill Hex. As they travel along they are stopped by two Pinkertons searching for them. One of the Pinkerton's notices Jonah's boots and Clinton shoots both men using a two shot pistol hidden up his sleeve. Hours later they finally arrive at Ma Clinton's place. While Clinton's mom & sister tend to Hex's wounds, Clinton talks to his men about how Graphus was waiting for them at Franklin Forks. Terry, one of the men, says that the town was clean when it cased it the previous night. Eventually everyone beds down for the night. The cover had an interesting bit of art. The bullet holes show the splash page underneath. Too bad that there weren't actual holes in the cover, but that was reserved for the higher end books with the pure white paper. This is a throwback to the lettering last seen on Issue 70. I like a more dynamic/edgy cover like this, but I prefer the more 'playbill' style lettering. Next Issue: Terry gets his, Graphus gets sloppy, Clinton has to make a decision, and Jonah realizes that life stinks. One would think that gunning down innocent choir members would be considered a BAD thing. But I guess that is because we are supposed to feel that the Pinkertons are just as bad as the outlaws. I haven't read this issue before, but it's pretty good. Is it just my browser or is #74's entry repeated twice and #75 is absent?